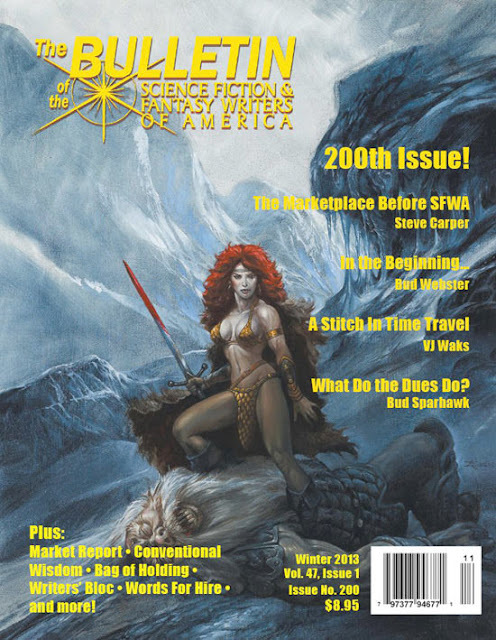 This cover on the 200th issue of the Science-Fiction Writers of America made a big fracas recently when subscribers, mainly female, complained about the overt sexism of the cover and some of the writers of the magazine. The number of complaints was unprecedented and unexpected. As a note, the cover itself has nothing to do with any of the articles within that issue. In other words, it's totally gratuitous. I don't subscribe to the SFWA magazine and I'm not a member so I can't say exactly what's going on or wrong with the whole sexism debate even if the cover does seem a tab outdated with its 80s Heavy Metal aspects BUT I just hope that anyone who made the complaints don't find this blog, PEPLUM X or the PEPLUM genre as a whole. But look at how tough and capable she is, having just killed a giant something-or-other, and she is not even breathing hard. I should think that such heroic symbolism would be admired, unless all those women who complained were just sloppy housewives who feel threatened by her appearance. These are the author's opinions alone, and the blogger owner should not be attributed to them in the least. I think that I need to make that clear herein, for your own protection. Steven, the women complained that why are women in fantasy roles always wear little clothes while the men are covered from head to toe. I guess they never came across this blog to see what men are wearing in PEPLUM films or products. Yikes. cloudsinvenice, I've tried to see where the whole blow-up occurred, having read so many websites and official facebook pages of the authors in question and I've read the info at the link you provided and I still can't see what caused so much anger and energy to be wasted in the first place. Yes it's true that the authors and their opinions are antiquated, to say the least, but I still can't believe the level of animosity in this debate. It's mind-boggling. Thanks for the link.